Baleful is a short horror game that puts the player in an unfamiliar house. You may feel alone in this uncanny home, yet there are traces of someone (or something) else here. This game features slightly flashing lights. Just run SpookyHouse.exe and enjoy! First of all thanks a lot for this amazing experience...Liked it so much, want to see more. Muy buena intriga, gran juego. I had a great time. I was actually stumped a for a few moments and the scares had great timing. Well done! Don't mind the foul language..I couldn't help it. The update just felt scarier! I told you guys I would play the update and I even made it a bit more special by posting it on Sun. (I typically post on Sat.) I love this game so much. I left a little creators note in the description too, I hope you enjoy! I love the creepy feeling you gave the house. Nice concept. I liked the Jack/Queen/King puzzle but I wanted more spooks tbh. Thank you for the demo, here is my Twitch playthrough. Ready to see what's next! 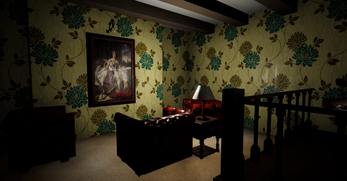 Loved the design of the house and the unsettling atmosphere. Well made with well timed scares. Cool game I gave it a try. I had fun with the demo and looking forward to where this is going. The house is a disgusting house tho. Nasty house. This Baleful demo seems like a good start for whatever the completed work will be. While many aspects felt like ideas other games have been using these days, it still managed to make its own way with them and was entertaining to play. The only issue I have with the game is how doors work. Otherwise, this is a decent work. Please make this into a full game! I loved it! I hope all of you viewers enjoy as well! Had a blast playing this, great job playing with anticipation and expectations. Looking forward to seeing more of it in the future. I could't play all the way through. Every time I would crouch I fell through the floor. This had such a great vibe and atmosphere! The puzzles were challenging enough that it wasn't frustrating! This game has some real potential and would be cool full game! The build up was great. I was disappointed by the finale and hope to see you continue to flesh out this game. So rad. Really enjoyed this game! Here are some of my thoughts as I played it. The atmosphere was incredibly unsettling. If anything, having very little ambient noise was a huge strength, leaving me painfully aware and paranoid of all the noise I made doing anything and made other noises really stand out. The moment after the phone call when you see the door leading to the jack/queen/king area was great. I knew I HAD to go in there since there was nowhere else to go, but the anxiety of just finding out that I'm not alone in the house made me dread going in there. Same goes for when it was time to walk into the basement. 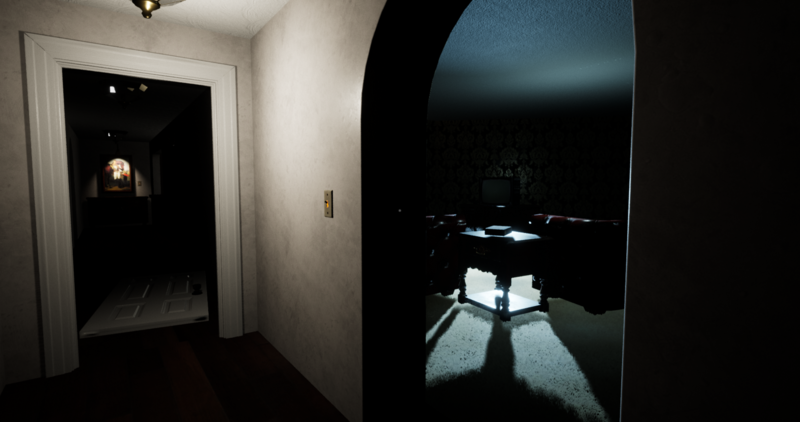 You use lights and locked doors to guide the player through a linear track through the house, which is great. However, the globe lights going up the stairs encouraged me to try to venture up before I was "supposed to." Once I realized that and tried to go back downstairs, I struggled to go back downstairs because I couldn't see the railing in the darkness. I'd suggest keeping these globe lights off until it's time for the player to travel upstairs. I picked up a key, but to my knowledge I didn't do anything with it? When I reached the locked front door, I tried to pull up an inventory by randomly hitting typical inventory buttons (I, tab, escape), and it wound up freezing my game (I believe Escape was the culprit). I assume in later versions there will actually be a use for the key, but until then I'd suggest keeping them out of demos. Convincing a player that actively moving towards a visible threat is usually pretty difficult. 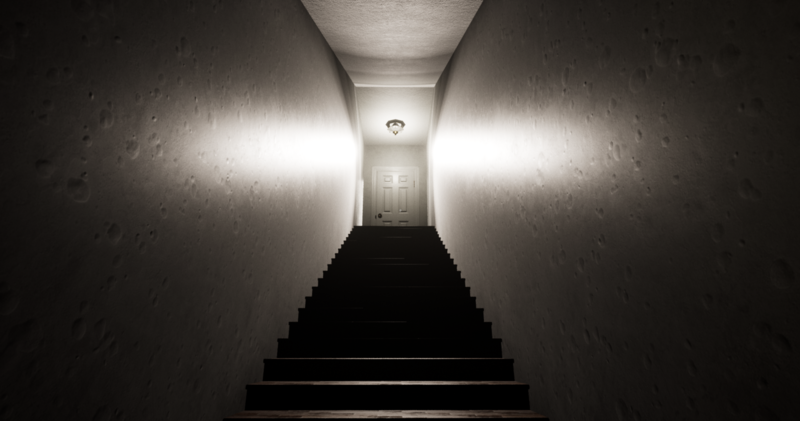 Already being kind of anxious from having to walk into a dark basement, the reveal of the killer at the bottom made me expect some sort of chase/hiding sequence through the house, since being at the top of the stairs gave me a head start to get away. It wasn't until like 15 seconds later when I was still at the top of the stairs and nothing had happened did I realize that I had to go down to trigger anything to continue. You raise some very good points for improvement and we intend to address any issues at one point down the road (whenever that may be). Amazing Game! One bug I think you should work on, but other than that amazing! CAN YOU STOP SAYING I GAVE IT A GO SHUT UP! This game is a good example of how to make a very atmospheric horror game without no real danger, but even though there was no real danger, the game still kepts you on your toes and made you feel like there was danger. Also, nice touch with the rick ainsley music. A seemingly normal meme turned out to be something more horrific. Good job devs. The game has really nice atmosphere, but no threat. It was so nice of my uncle to leave me a message. It sounds like business is picking up! P.S. Is there a way we can donate to you so we can support you on your next project? ***Video includes original gameplay and "spooky update" with new ending. We aren't accepting donations at this time. If you would like to support us, simply playing the game and spreading the word is more than enough for us. Thank you so much! Really enjoyed this! Very creepy and had me edge the whole time! Looking forward to the full version! Thanks to the developer! This game is awesome! Gave it a try and i can easily say i really liked it! It has potential and can be transformed into an even more horrifying experience. Also i would suggest to fill the background music gap with e.g household sound effects or ambient music clips etc etc. Thanks for making this, hope to hear more from you soon! The game has potential but lacks any real threat. Also Rick Astley. Ooh, got the spooky update out just in time for recording. I'll be back with a video. Edit: Not sharing the whole video yet, but this was my favorite moment. The whole game was the equivalent of somebody threatening to hit you in the eye with a stretched rubber band for 20 minutes, and I loved it so much. I really wish I had a heart rate monitor, because I'm pretty sure my heart rate stayed high from the moment I turned around after I turned on the basement lights. Great job. Just edited the original comment. Good timing! Whoops, set it to private instead of unlisted. Should be visible now.